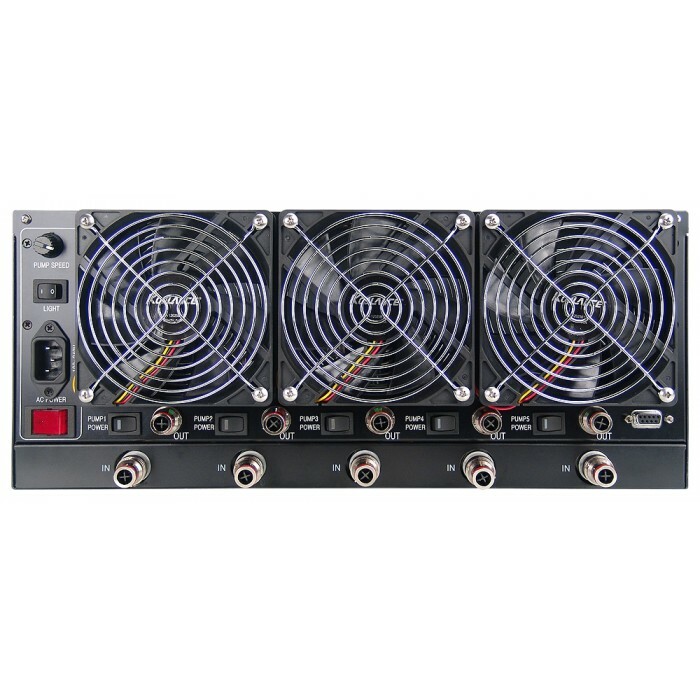 The Koolance ERM-3K4U is a dedicated liquid cooling system for very special thermal applications. 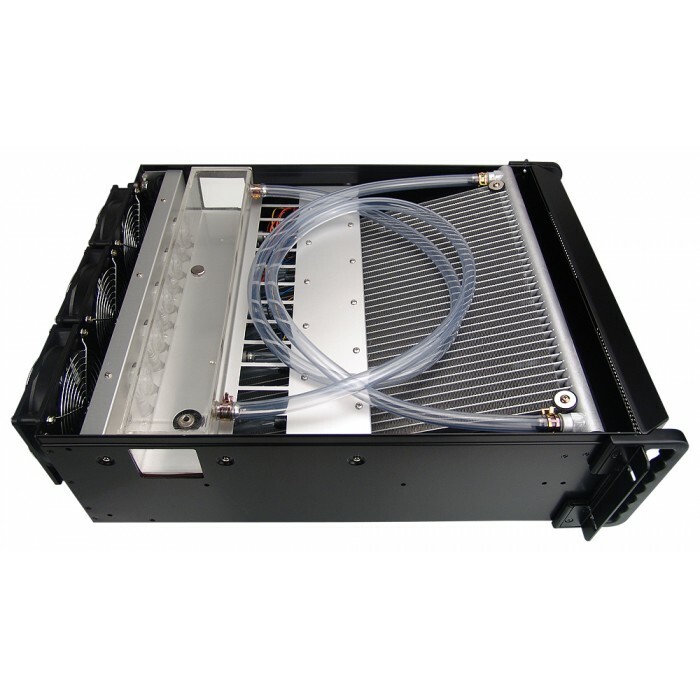 It can provide up to 3000W of potential heat dissipation, and is housed in a lightweight aluminum enclosure. 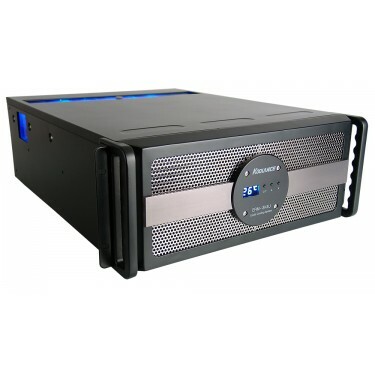 By default, the ERM-3K4U is offered in a standard 4U profile rack-mountable unit. However, with the handles removed and LED readout rotated, the cooling system can be operated in a vertical "tower" position. The ERM-3K4U5 utilizes five powerful PMP-400 pumps, each with separate auto-shutoff quick disconnect fittings. Due to extremely high pressure and flow rate, 20 or more computer processors might be connected to a single ERM-3K4U5 system if within the total dissipation rating. For example, four computers might be connected per pump loop. A large louver-fin heat exchanger stretches diagonally from front to back, and is cooled by six 120mm fans. 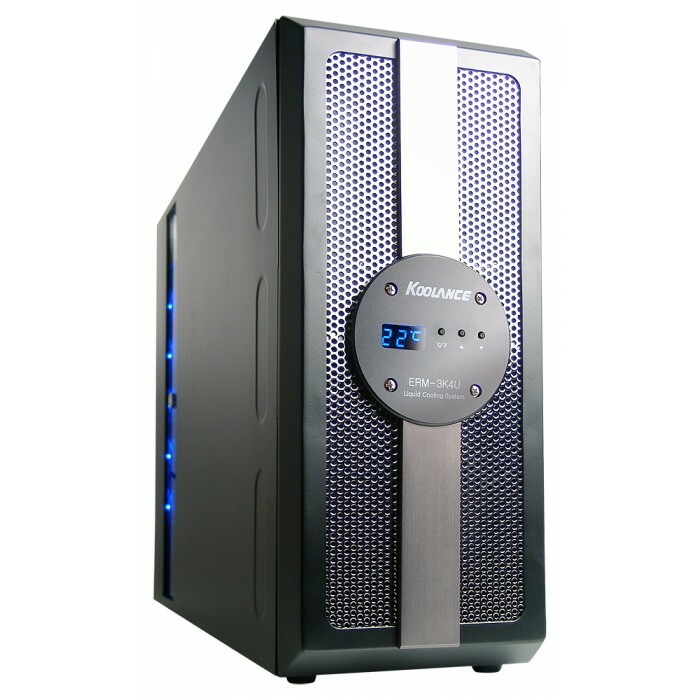 Fan speeds are automatically controlled by reservoir liquid temperature, or with 10 manual user settings. A flow meter is integrated for each pump behind the reservoir, allowing for a quick visual inspection of flow status on each outlet. A rear DB9 connection is provided for 3rd-party utilization of the flow meter signals.